October's Bear Club packed is here and it's packed full of summery, mostly Australian, offerings. I had meant to get this review up around Christmas/New Year but life got in the way. Work is finally quietening down after a ridiculously busy January and I am able to get this finished - conveniently just before the next pack is about to go out. I kicked off this Bear Club pack with the latest offering (at the time) from Exit; their #011 American Red IPA. This was the last beer they brewed down at Cavalier before their move to join Kaiju in their own brewery in Dandenong. This is exactly what I want in a red IPA, with a big caramel malt base packed full of piney hops. I really hope they do this beer again! Riverside's 2014 GABS beer, Othello's Curse, an Imperial Black IPA was the second beer I got into in this pack. 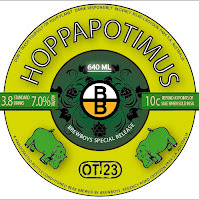 I loved it back then and I still love it now with roast combining with big citrus and pine hop flavours. The mouthfeel is lightly creamy and there's even a touch of vanilla flavouring at the back end. I can't name a better Australian Black IPA! 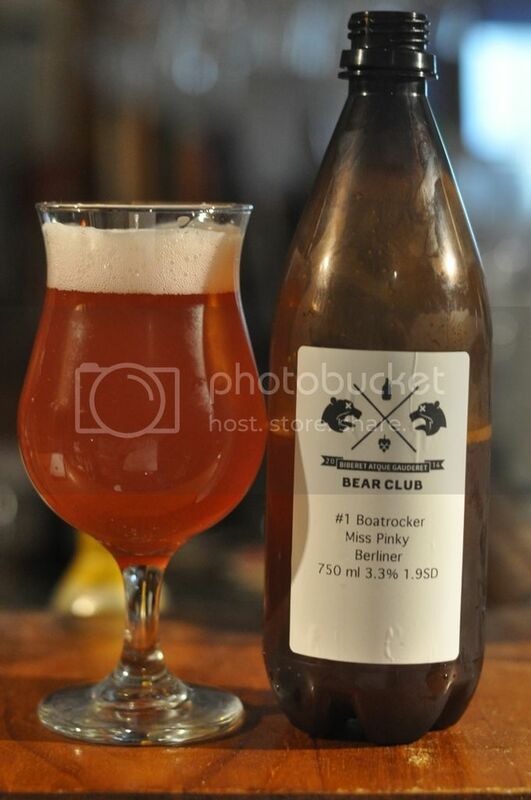 As a precursor to our work Christmas party I had Boatrocker's excellent (and recently released in bottles!) Miss Pinky. It's a 3.3% Berliner Weisse packed with 100kg's of local raspberries, which gives it this distinctive light pink colour. It's a wonderfully complex considering it's ABV. Fruity sweetness combines beautifully with some lacto sourness and the finish is dry. It's a beer that I would love to drink all afternoon on a hot summer's day. Can't wait to get some bottles of it! The first of the internationals was Wolf Among Weeds from Golden Road Brewing from San Francisco. It's an Imperial IPA that I'm quite familiar with, having had some cans when they first came out here in 2014. It's got heaps of tropical fruit flavours, plenty of citrus and some pine. It's a very, very juicy IPA! Continuing with the hoppy beers, Kooinda's new Sun Hunter IPA was next up. This IPA tasted very very fresh and the hops were pungent citrus, particularly orange. There was a little bit of passionfruit and apricot that I could make out, as well as a hint of pine right towards the end. 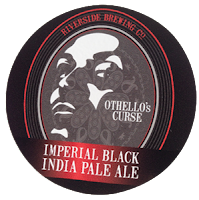 This is going to be released in bottles soon and I'm looking forward to trying it again soon. Fortitude was a brewery that I had never had a bad thing to say about until the awful infected Golden Ale in #craftbeercountdown. Their RSVP (Rum Smoked Vanilla Porter) brought everything back into the positive for me. It was excellent, with vanilla dominating but smokiness and oak both also evident as well as rum notes. I really hope I can get my hands on some more of this! South Australia's finest beer; the Prancing Pony India Red Ale was next for me as a replacement for Riverside's 777, which had unfortunately run out. I think I came out on top though as the Prancing Pony is a beautiful beer! It's perfectly balanced, with Prancing Pony's distinctive use of malt (see Fire Brewing) on full show, whilst tropical fruits from the hops play a huge part in the flavour. Another very fine South Australian offering followed. 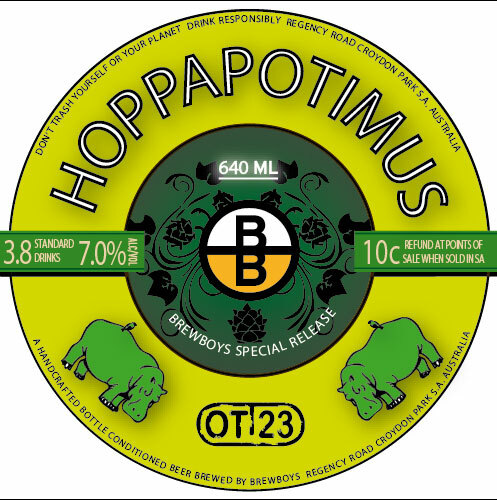 Brewboys' Hoppopotamus is quite possibly the finest IPA in the land. It's a beer packed full of tropical fruit, citrus and pine hops. It's got a big malt backbone and is subsequently beautifully balanced. If you want more details check out my review here. I was so pleased to see Garage Project's Death from Above in this months pack. Off tap this beer is even better than the bottle! This batch I felt had more mango and less chili, although there was still enough to tickle the tongue. Read my 2013 review here. Before November I don't think I'd ever had BrewDog's Russian Imperial Stout; Cocoa Psycho. This somewhat surprised me as I have loved BrewDog for years! It had quite bitter roast coffee flavours up front, which were in turn surpassed by deep rich chocolate. There was even a hint of vanilla and oak towards the back end. It's velvety smooth and hides the 10% ABV dangerously well - this is a RIS that will find it's way into my fridge over winter. Blackhorse Brewhouse is a brewery I had never heard of until Tru Bru stocked their stuff. They're a brewery from Western Sydney and their Steam Ale was the last beer I sampled in the October Bear Club. It's a very easy drinking beer, with relatively low carbonation making it go down very easily. Having said that it's a bit bland and doesn't really stand out from other similar beers. I'd happily drink one at a BBQ if handed one, but won't be seeking it out. I haven't heard when the next Bear Club pack is being released, but can assure you that some of the selections are really top notch! Those of you who are still yet to sign up, this would be a great month to start! Thanks for reading again guys, hopefully there will be a bit more new content up tomorrow - I've got lots of partly written things that should hopefully all get posted in the next week or two. I'd like join but I'm not a hug IPA lover and there seems to a healthy lean in that direction. As for Blackhorse, they're from the Shire I thought. Tried 3 of their beers at a Sydney CBW event a few years back. They all tasted dreadful and their beetroot ale takes pride of place alongside Matsos Chilli Beer as "worse beer ever".